Luke McDermott (Westerlo, N.Y.) scored two goals and eight other U.S. players registered at least one point as the 2018-19 U.S. National Sled Hockey Team defeated South Korea, 9-0, in its second game of the 2018 Para Hockey Cup. We got contributions across the board tonight and overcame some early adversity to get another quality win," said David Hoff (Bottineau, N.D.), head coach of the 2018-19 U.S. National Sled Hockey Team. "This was our goal at the start, to come in and skate our way to back-to-back wins. We'll use the day off tomorrow to take care of ourselves, watch some video and get ready to face Canada again on Thursday. The U.S. took control from the start, outshooting the Koreans by a 10-1 count but were unable to convert over the first 10 minutes of play. With 3:45 remaining in the first stanza, Team USA broke through with four goals to take a 4-0 lead. Josh Hargis (Colorado Springs, Colo.) opened the scoring at the 11:15 mark with his first goal as a member of the U.S. National Sled Hockey Team. The play started along the left-hand wall where a loose puck found its way to Roybal who was able to find Hargis alone at the right face-off dot for a shot that beat Korea’s goaltender Jae Woong Lee. Just 1:03 later, Roybal scored unassisted to double Team USA’s lead before Declan Farmer (Tampa, Fla.) fired home a shot off a pass from Kyle Zych (South Hadley, Mass.) to make it 3-0. With :58 to play in the frame, McDermott accounted for the final U.S. goal by putting home a loose puck in the crease. The second period saw the U.S. extend its lead with a five-goal outburst. Zych and Farmer, who connected for a goal in the first period, worked together again for another goal 3:52 into the frame when Zych made it 5-0. Rico Roman (Portland, Ore.) then tallied his second goal in as many games a minute later. Travis Dodson (Deming, N.M.) and Noah Grove (Frederick, Md.) then scored their first goals of the tournament before McDermott netted his second goal of the game with 5:26 left in the frame to give the U.S. a 9-0 lead into the second intermission. U.S. goaltender Jen Lee (San Francisco, Calif.) turned aside all four shots he faced to give the U.S. back-to-back shutout wins to open the 2018 Para Hockey Cup. NOTES: Luke McDermott (Westerlo, N.Y.) was named the U.S. Player of the Game ... 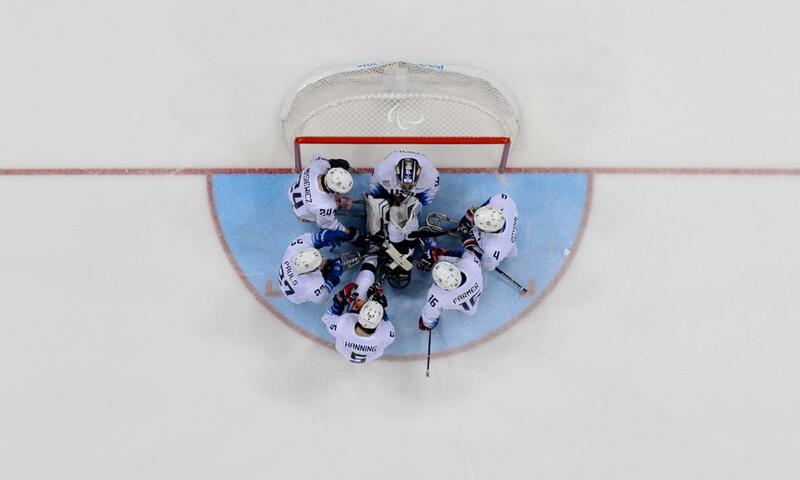 The U.S. outshot South Korea, 31-4, while finishing 0-for-2 on the power play … For complete statistics, click here … Deloitte, Labatt USA and Toyota are proud sponsors of the U.S. National Sled Hockey Team … For complete coverage of the U.S. National Sled Hockey Team, click here.